“ Apple TV is a tiny digital media player which allows you to enjoy a whole world of movies, TV shows, sports, music, and more. So far, the latest version of Apple TV is the 4th generation, What I wish to do is to stream MKV to Apple TV 4 for smooth playback. As far as I know, MKV is a non-apple approved video format. That means we can’t add and play MKV on Apple TV 4 directly. An easy solution I’ve worked out is to convert MKV to Apple TV4 playable format, so that you can avoid video playback issues.” >> Apple TV 4 vs Roku 4. The MKV to Apple TV 4 playback issue is caused by the video format limitation of Apple TV 4/Plex. If you check Apple TV 4 user manual or its product page you will learn that Apple TV 4 supported video formats are limited, it can only play H.264/MPEG-4 MOV, MP4 and M4V files, for other video formats like MKV, AVI, WMV, etc. Apple TV 4 is not able to play them, so you can’t play MKV on Apple TV 4/Plex direct. Okay, for all users, if you want to stream MKV files to the new Apple TV, Apple TV 3/2 for playback, you’ll need to convert your MKV files to Apple friendly format (e.g. m4v). Along with some help from third-party software. With Pavtube iMedia Converter for Mac, a great Mac MKV Converter for Apple TV 4, you can easily achieve your goal smoothly. In addition to converting MKV to the new Apple TV, it also can MP4, H.265, Tivo, AVCHD, VOB, MPEG-2, MXF, WMV, AVI, DivX, Xvid, Flash format, WebM, and etc to Apple TV 4 video format. Overall, this all-in-one Video Converting tool can help you to rip Blu-ray, DVD and various video files to your Apple TV 4 for watching. Furthermore, it is also equipped with advanced editing function like add subtitles, effect, text or picture watermark to MKV files, crop MKV black bars, trim or merge MKV files, compress output file size and etc. (Learn more functions in this review). 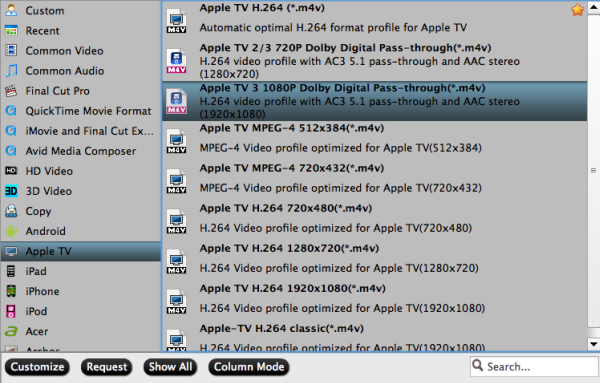 The following guide shares with you how to encode 1080p/720p MKV to Apple TV 4 for playback on Mac step-by-step. Step 1. Install and launch the MKV Converter for Apple TV 4, and click “Add file” or “Add from folder” button to load your MKV files. 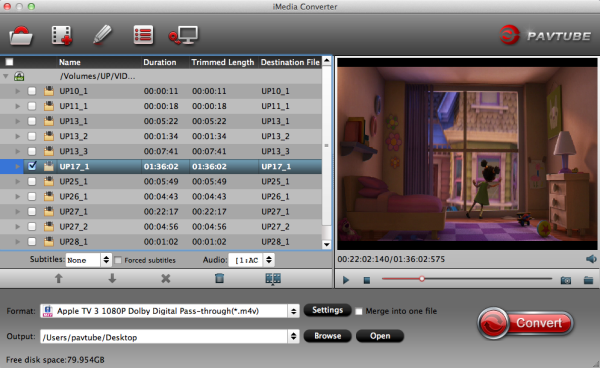 The software supports batch conversion so that you can add several MKV files to convert at one time. You can also load Internet torrents movies. Click on the dropdown menu of “Format” and then move your pointer to “Apple TV 3 1080P Dolby Digital Pass-through(*.m4v)” from “Apple TV” which is the compatible format for Apple TV 4. Then you can set the output folder by clicking “Browse” icon as you need. Note: While, Blu-ray movies are normally compressed in MKV file format with surrounding sound – dts audio. Dts audio may not be the file type for Apple TV 4 to handle as its nature as surrounding sound that requires multi-speaker to pull off. Read here. Step 3: Adjust audio and video parameters. Click the “Settings” icon and you will go into a new interface named “Profile Settings”. You can adjust codec, aspect ratio, bit rate, frame rate, sample rate and audio channel in the interface according to your needs and optimize the output file quality. To get AC3 5.1 auido files, you can set audio codec to AC3 and change audio channels to 5.1 Channels. Learn>> how to set up Apple TV 4. Step 3. Finally click on “Convert” button to start converting MKV to 1080p HD M4V for Apple TV 4 on Mac. After conversion, get converted video files for transferring to ATV 4 via Plex from Mac. 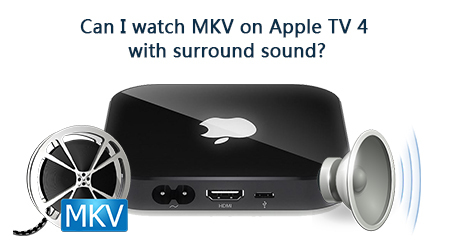 In this way, you can get MKV files playable on Apple TV 4 with Mac OS X without problems. We hope this short article will bring some new multimedia life to your Apple TV 4. Via iTunes: Firstly, add the converted MKV videos to iTunes. Then, go to iTunes > Preferences, choose Apple TV, and make sure “Look for Apple TVs” is selected. Secondly, on your Apple TV 4, choose Settings > Computers > “Connect to iTunes,” and note the passcode displayed; in iTunes, select the Apple TV 4 (below Devices), and enter the passcode. Thirdly, click the Summary button and select one of “Automatic Sync” and “Custom Sync”. Now, all content are streamed to Apple TV via Plex for enjoyment. Could you image an easier way to do this than Pavtube MKV to Apple TV 4 Converter?